Sippy cups sometimes have a way of going missing-whether they’re left at the park, lost at preschool, or hidden under the car seat. Our popular Take and Toss 10 oz. 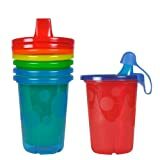 sippy cups are durable enough to use over and over, yet affordable enough that it’s not a huge deal if they get lost. Your child will love the colorful cups, and you’ll love the snap-on, valve-free, spill-proof, interchangeable lids that are easy to clean. The bonus travel cap is included for on-the-go sipping. Sip sip hooray!